← Weaz dem cosmic rays?? The past year (2007) witnessed a transition from a weak El Nino to a strong La Nina, with the latter now beginning to moderate as evidenced by the warming waters off of the coast of Peru. There seems to be more going on that just a dissipating La Nina (I would expect a shorter jump), and there are clearly anomalous conditions recently over Asia…not exactly sure what is going on. These 3 GISS maps show anomalies of Jan 08, Feb 08, and March 08 relative to the standard GISS base period. Also of note is missing data in Africa which would effect what is going on. SkepticalScience also shows us this graph with the SOI index, so it appears La Nina is at least partially responsible. The Southern Oscillation Index is a measure of La Nina, with a more positive SOI meaning La Nina( El Nino would have a more negative SOI). The U.K Met Office says that 2008 will probably still be a top 10 year, but a bit cooler than recent years because of the cold januray and february (next skeptic line: Global Warming Stopped in 2008!!!). But the point is that January did not cancel out any global warming, and there’s nothing unusual about La Nina. I predict that 2008 will be a top 10 year (certainly above the 1951-80 baseline), but will not break any records. This entry was posted in Uncategorized and tagged global warming, La Nina. Bookmark the permalink. Ice records in Antarctica: East Antarctica ice is expected to increase due to anthropogenic climate change, due to increased precipitation. It is so cold over there that current climate change is not melting any ice. West Antarctica is another story though. Concluding that global warming is “canceled” on ONLY one month of data is UNSCIENTIFIC. Moreover, the concept of La Nina is nowhere to be found in that article…strange. Finally, articles as these give insight on the reliability of the sources that anthropogenic climate change naysayers refer to. Woah, Felipe, you are taking the article and the article’s source out of context. It never claimed that the data was settled, or proved that GW was over, merely that it could have been the start of cooling, or something alltogether. Now I’m not sure about all of this, maybe Chris can help us out here, but wasn’t this the biggest dip in 12 months over 30 or so years? Is that how ENSO is supposed to work? I’m not really sure. Nice site Chris, I’m just looking through it all now and I found this topic of particular interest. It absolutely fascinates me when people can take something so “extreme” on this topic and then run and speak on others being “extremists”. A couple months of unusually cold winters don’t cancel about nearly 100 years of overall warming. That’s just laughable. Last Septemeber some scientists noted within their comment sections that they foresaw a unusually cold winter this year due to the combination of the recent ice melt in the Arctic and the La Nina that was gaining strength. It’s the usual story though from most skeptics,and they are just to be laughed at UNLESS, they have significant information/data to support their opinions. Just looking over your site for the first time and I like it. 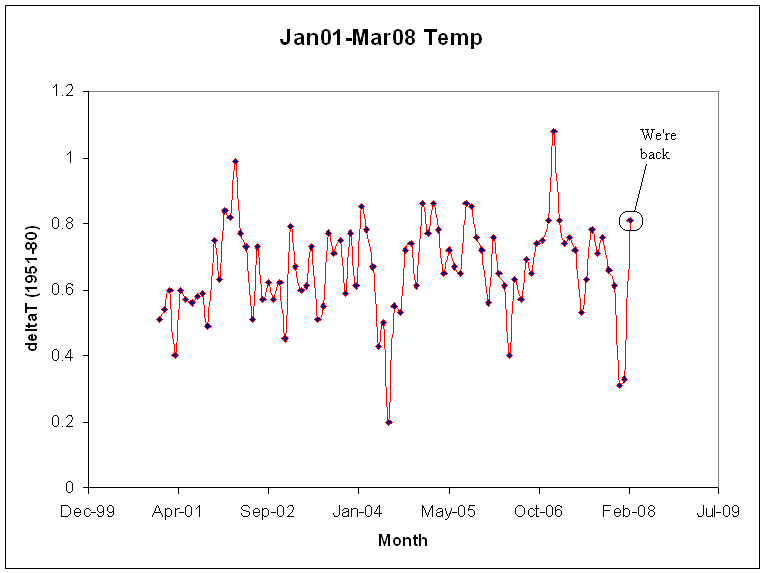 Maybe it’s because this is an older post, but your 2008 GISS data seems to be off.